Authentic tone, action, and feel. If you're looking for a virtual electric piano, this is the one. The completely renewed factory library features classic electric piano sounds as well as over 240 gig- and mix-ready custom electric pianos making good use of the compressor, equalizer, and multi-effect processor. Fully functional. Less than 49.0 MB to download. Seconds to install. The Play panel presents shortcuts to effects, performance settings, and key tonal controls. Lounge Lizard comes with an extensive preset library that is simply inspiring—giving you access to the classic electric piano sounds popularized by musical legends like Chick Corea, Herbie Hancock, Stevie Wonder, and George Duke. There is a choice of pure and true tones as well as a selection of processed ones courtesy of the high-end effect section. Electric piano players seem to be divided into two camps: tine-based or reed-based. Whatever the preferences both instruments have been popularised in thousands of songs by legendary musicians. 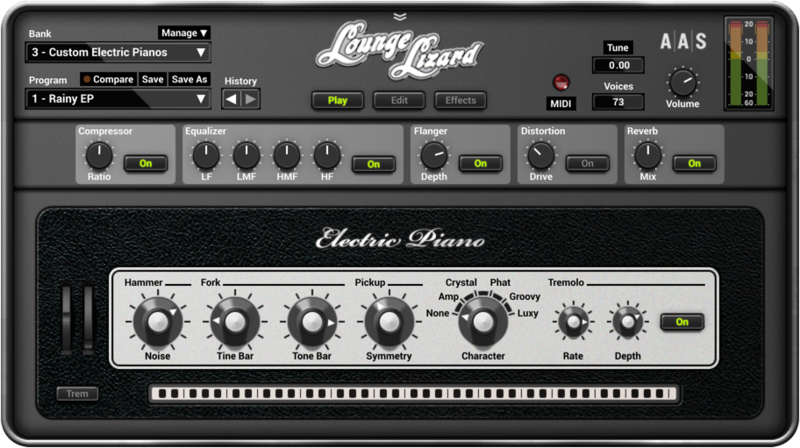 With its extensive library of custom tones and its authentic playing feel, Lounge Lizard will provide you with a truly inspiring electric piano experience. Famous players all had their own signature sound. This was achieved by tedious manual adjustments of forks, hammers and pickups. Whether you are looking to emulate a particular sound or simply find your own, you have direct access to all piano components. Control the attack with the hammer. Adjust the force of the impact, the stiffness of the hammer and the noise it makes. Modulate these across the whole keyboard range or depending on the MIDI velocity. A sweet sound is produced when the hammer hits the fork. Control the tone and its envelope by selecting material and natural decay of the tone and tine bars forming the fork. Like in an electric guitar, a pickup near the fork captures its vibration. Adjust the pickup position and control distortion. Get a warm smooth tone or make your piano growl or bark. Control how dampers are raised from or applied on the fork and make the attack and release of a note clean or noisy. Adjust the tremolo to perfection. Use a triangle shape for a smooth effect or a soft square wave to obtain a chopped effect typical of suitcase pianos. Weather it is through the use of strange effect combinations or setting the piano parameters to extreme values, Lounge Lizard can really become a wild beast. It retains the playability of a keyboard instrument but sounds beyond anything you have heard from an electric piano before. The electric piano has marked the history or rock and jazz. The factory library showcases many presets designed around effects typically with pianos and reproducing the distinctive sound of classic tracks. A complete video series of tutorials on Lounge Lizard EP-4 made in collaboration with Groove3. Learn all about the ergonomics, the modules, and the sound of our electric piano. But the killer feature is that Lounge Lizard EP-4, by its liveliness, great dynamics, and outstanding sound quality, simply tempts the user into making music. And this is – in our opinion – the best feature that an instrument can have. Version 4 takes things to another level in terms of the sound and what can be achieved with Lounge Lizard EP-4. It simply can’t be beaten by any other electric piano plug-in. 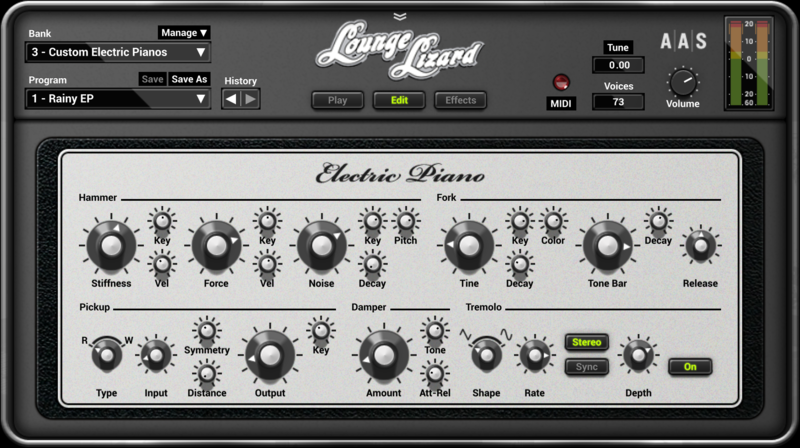 The finest software electric piano emulation to date, simple as that. It even looks vintage too!. This virtual instrument offers a limitless supply of vintage keyboard tones—using some of the most sophisticated modeling technology available. 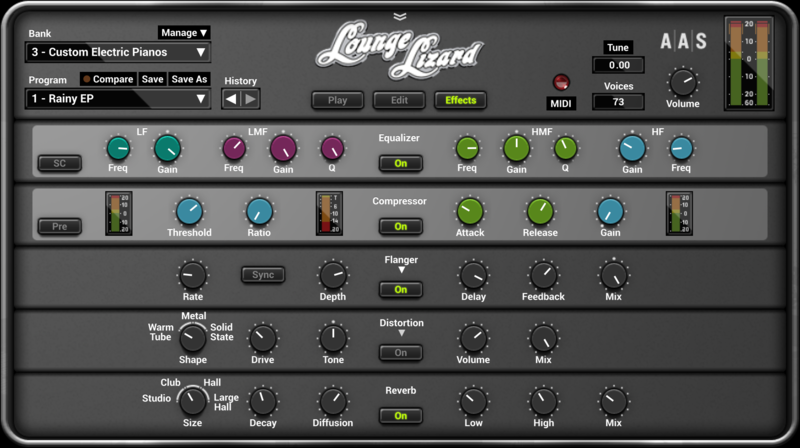 Lounge Lizard EP-4 is compatible with nearly all DAWs. What type of copy protection does Lounge Lizard EP-4 use? Can I re-authorize Lounge Lizard EP-4 if I upgrade or change my computer, or have a computer crash? The license agreement for Lounge Lizard EP-4 allows authorization on up to two computers which belong to you. You might need, however, more than two authorizations if for example, you get a new computer or change some piece of hardware such as the hard drive. In these situations, it won't be a problem to obtain additional authorizations. Are upgrade paths available for Lounge Lizard EP-4?